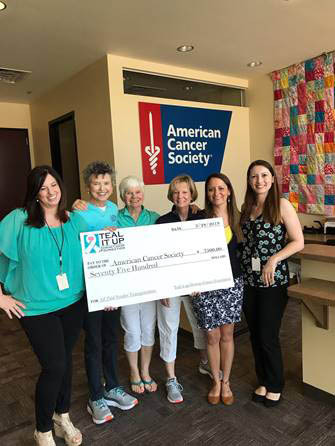 Teal It Up Ovarian Cancer Foundation recently donated $7,500 to American Cancer Foundation earmarked for their transportation program. Forty percent of their rides are breast and ovarian cancer patients. The foundation is excited to support such a program. Health Systems Managers Beth Houser is in the teal shirt on the far left and Amanda Sweeney is on the far right. Next to her, second from the far right, is Jane Hahn, Program Manager of Mission Delivery. Jan Coggins, President, Rhonda Hall, secretary, and LeeAnn Newcomb, treasurer.